Unfortunately, the preliminary concepts presented at the November 29th public meeting appear fixated on accommodating future traffic above everything else. Future traffic is about additional trips. 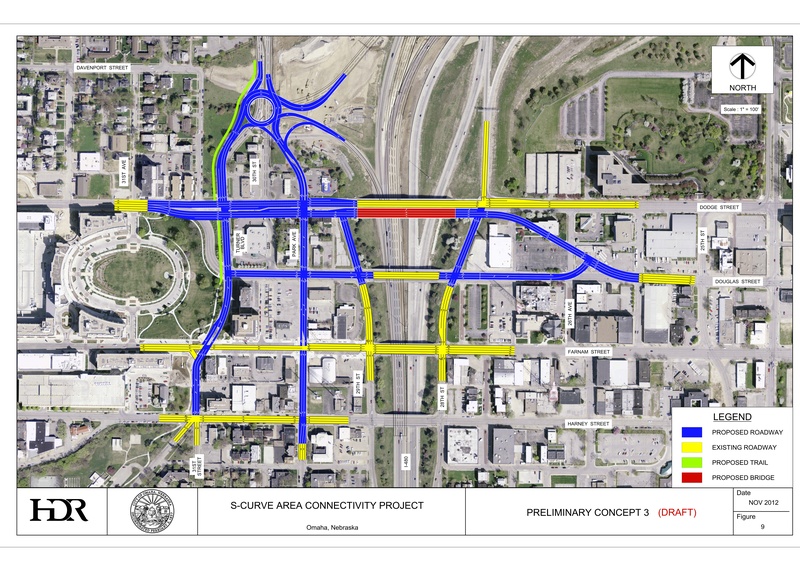 With the Central Omaha Alternatives Analysis, the Harney Street Cycletrack and an extension of the Turner Blvd Trail well on their way, there is no reason to expect that new trips will have to be by car. This project should be more about the people than the capacity. In other words, what is going to make people want to live, eat, shop and invest in the area? The quality and the character of redevelopment will match that of the streets we build. If the vision for the neighborhood is urban infill where people walk, bike, take transit and drive, then there should be no alternative that substantially increases capacity for cars and/or tears down homes and businesses in the process. Based on that criteria, 1B, 2E and 4 are the best concepts. All the other concepts will make the area more hazardous and inhospitable for residents, customers and people in general. As a community, it is essential that we enable the project team to focus on the neighborhood. Informing them that these are the top three will clearly communicate that we want Midtown to mature into Omaha’s next great neighborhood. Otherwise, the planners and engineers will understandably revert to the status quo: transportation for the sake of transportation. Your comments empower their creativity. These alternatives are not set in stone, and the final “preferred” alternative will be a mixture of these designs. So when you contact the city and the consultants, feel free to specifically call out what you like and what you don’t like as well (but stay positive, constructive criticism). Once the preferred alternative is decided on, it’s unlikely to change. 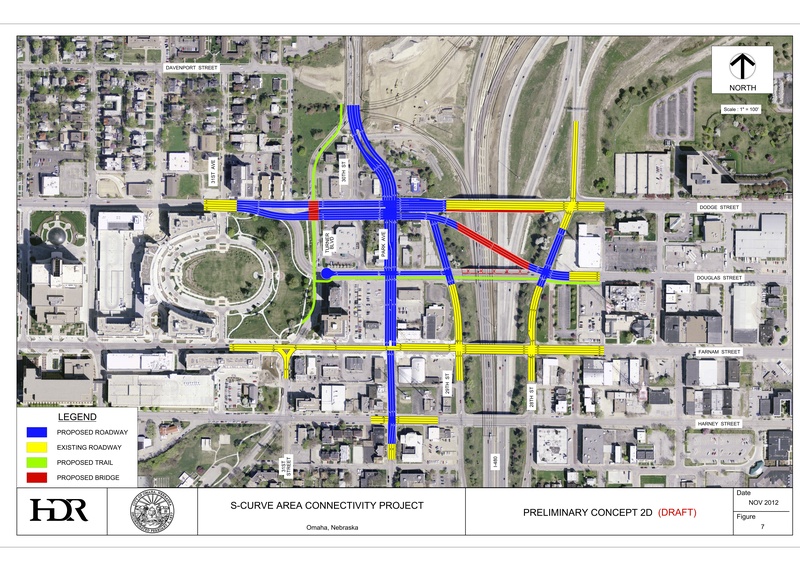 Think of this as your last chance to have your voice heard, at least on how traffic flow will be configured for this area. Comments will be accepted until January 6, 2013. Click here to email your comments. The only design that handles future traffic without any widening, clearly the least cost solution. The curve becomes less severe. project can probably afford a two-way conversion, because it won’t incur the cost of building a new bridge over I-480. There is no reason for Dodge Street to have more than five lanes, it will be loud and polluted and will be difficult and unsafe for pedestrians to cross. Make sure there is adequate space for sidewalks, street trees, benches and other street furniture. Sidewalks of less than six feet are difficult for groups of three or more to navigate. Street trees typically need at least six feet between the curb and the sidewalk to grow to maturity. Benches and street furniture are essential to encouraging street life and to stimulating foot traffic. Make sure there is adequate facilities for cycling. If there isn’t room or the need for bike lanes, then add sharrows or share the road signage. Make sure there is plenty of bike parking. Consider a safe crossing for the Turner Blvd Trail at Dodge Street, such as a Pedestrian Hybrid Beacon. 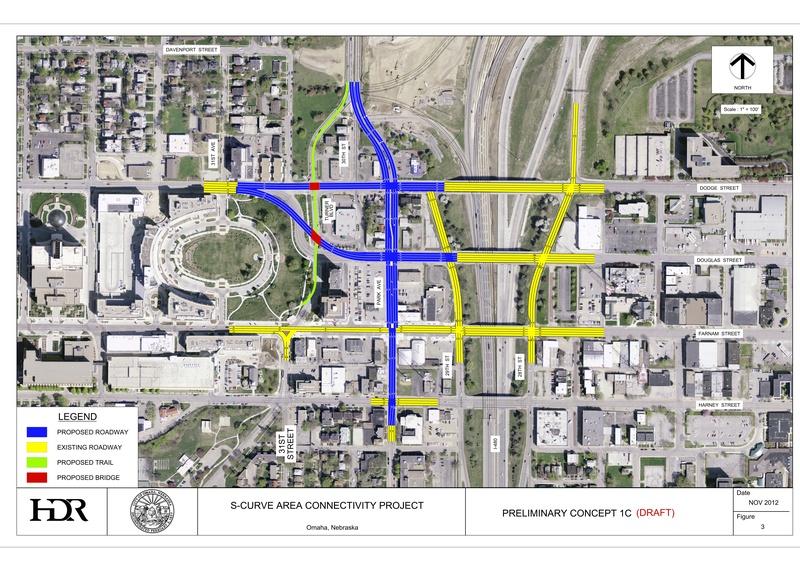 Create a pedestrian and bicycle connection between 31st & Davenport and the expanded Turner Blvd Trail. If the S-Curve moves east of I-480 or above I-480, keep the Douglas Street bridge. 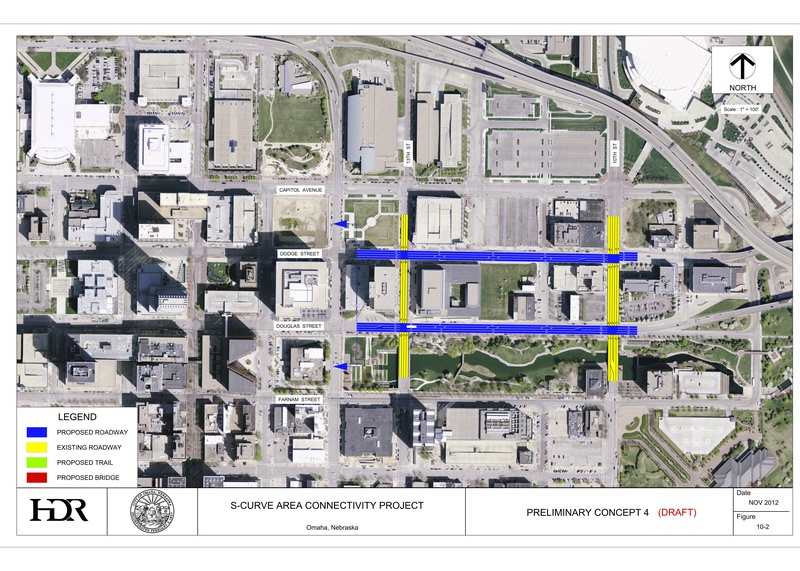 It could provide diagonal parking with two lanes of two-way traffic. The gorgeous view of Turner Park and Midtown Crossing is a huge development potential and shouldn’t be ignored. If Park Avenue or Turner Blvd are converted to two-way traffic, don’t add left turn lanes, a little more congestion at rush hour is worth leaving more space for onstreet parking, street trees and nice sidewalks. Consider saving money and space by leaving out some of the turning lanes and accepting a tiny bit more delay at the intersections. This should have been addressed by the developers of the Mid-Town remodel. I believe it is fine the way it is. A 2 way proposal for Dodge ST. ending on 24th is my vote. Thanks for your comments. Please also make sure to send them to Public Works! 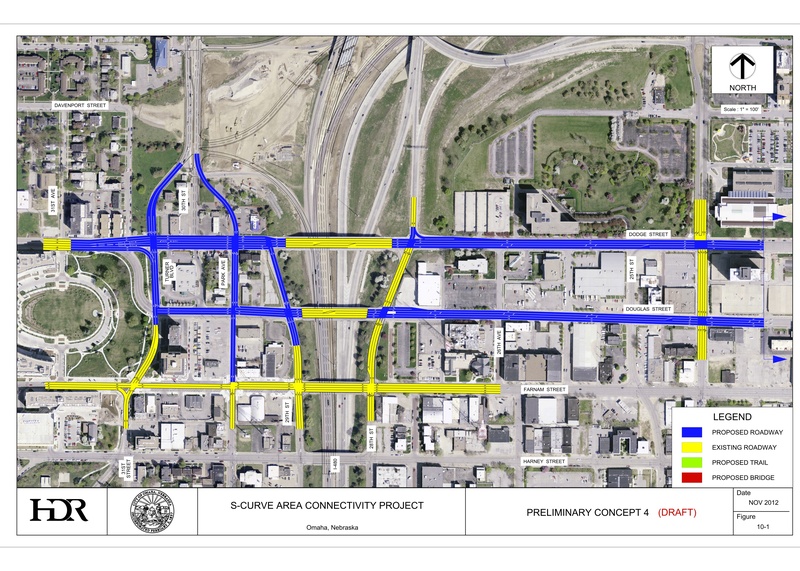 I don’t see anything in any of these proposals that is intended to result in reduced traffic in this corridor. Intelligent transportation planning for our future would result in fewer cars on the streets and fewer miles traveled by those cars. All planning should emphasize getting people on their feet, on bikes, and on mass transit. This would make it reasonable for Dodge and Douglas to be bidirectional with no S curve. Roundabouts have their own set of pros and cons and can be a challenge when first confronted. However, putting a roundabout at the immediate end of a highway exit ramp would seem to be asking for trouble since a highway exit ramp would see more traffic from visitors unfamiliar with the roads. How does mass transit fit into any of these solutions. Wondering if it is possible to build a BRT lane. Are the designs conducive to a relationship between mass transit and the people who want to use it or is it designed only for the auto? Good questions! Please send in to the city as well. See the email link above.